The basics of the book are this: it is the story of a grumpy man named Ove. Well, actually it is composed of the backstory that slowly changes our perception of Ove’s true character and what made him who he is, AND the current events and interactions that offer that perception change to others. Keep reading below for a brief synopsis. Ove, is fifty-nine, widowed for 6 months, and fired from his job. He has little reason to continue on, so he makes what to him is a perfectly reasonable resolution: leave this world and join his wife in heaven. The problem is the substantial earthly interference with his plans from a myriad of people, circumstances, and even a cat, who invade his personal space. 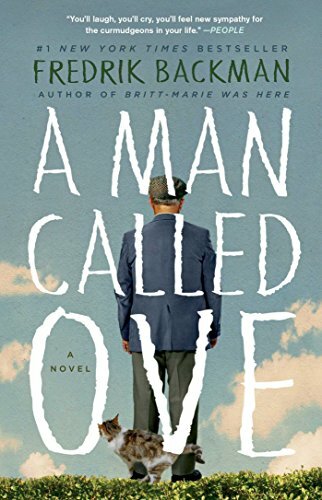 These characters are each brilliantly flawed but full of personality, which adds to the humor as their various needs and interactions juxtapose with Ove’s fastidious and solitary nature. In fact, their inability to do things right are what shake him temporarily from his grand resolution. He is compelled by some inner compulsion to make sure things are done correctly, which often, to his great annoyance, requires him to help someone. It does not take long to see how much Ove needs interaction with other people – and more important, how he needs to be needed. This grumpy old man has a valiant yet humble nature. He is old school – just doing what needs to be done – whatever the consequences and without needing or wanting praise for it. Through his give and take with a truly diverse group of individuals, most living right on his street, he and they finally coalesce into something we all crave – a community. If I can be so bold, I do not entirely like the first two dictionary definitions of community (common interests, goals, economics ..) preferring the third definition – an interacting population of various kinds of individuals in a common location. (Miriam-Webster online) Feeling connected to a community can be tough sometimes, but if you don’t feel you have one, go out and seek yours. Join or form a book club, say more than just hi and bye to your neighbors, invite a few co-workers to go out to lunch, invite people over for a regular game night, or find a volunteer opportunity. Just do yourself a favor and mix it up some, make sure you do not surround yourself completely with people the same age and those who think and act the same as you – variety is indeed the spice in life! Chances for community are all around you, know this – no matter who you are, where you have been or how different you are from those around you, they need you as much as you need them. I am starting to get a bit too poetic as I strive to not give away details of this humorous, deep, poignant story of Ove and his community. Therefore let me end where I started. Read it for yourself!